Literacy involves meaning-making with materials that humans use to communicate – be they visual, written, spoken, sung, and/or drawn. Definitions vary according to culture, personal values and theories. We look to a broad definition of literacy as guided by UNESCO to be inclusive for all families. Children learn to be literate in a variety of ways in their homes, communities and places of formal education. New research in three-to-five-year-old children’s homes and communities in Fiji, has revealed that children’s regular engagement in literacy across many different media has supported good literacy outcomes. There were ten main ways of engaging in literacy-building activities. These included print and information, communication and entertainment technologies, arts and crafts, making marks on paper, screens and other surfaces like sand and concrete, reading and creating images, and talking, telling and acting out stories that were real or imagined. Children also engaged with reading, recording and talking about the environment, reading signs in the environment, engaging in music, dance, song and, lastly, with texts and icons of religions and cultures. These activities were enjoyed and valued by children and their families as part of their everyday lives, and were further bolstered by creating books with children in their home languages and English. This research can be used to add to our discussions on how parents can help develop their children’s early literacy. The Melbourne Institute of Applied Economic and Social Research found daily reading to young children improves schooling outcomes, regardless of family background and home environment. The OECD Program for International Student Assessment (PISA) results also indicate a strong correlation between parents reading and storytelling with children in the early years and reading achievement at age 15, with those students performing one to two years above their peers. However, it is not just being read to that matters. The adult-child interactions are also very important. These interactions need to be lively and engage children with the text-in-hand. Alphabet toys and phonics programs alone offer little to develop literacy, as they focus on a code without contextual meaning. Words, and their letters and sounds, are best understood when seen and applied in everyday experiences, driven by children’s motivations. There are several practical things parents can do to encourage broad literacy and learning in early childhood years. Don’t wait. Read what you are reading aloud to your newborn. Children become attuned to the sound of your voice and the tones of the language you speak as their hearing develops. Share stories at mealtime. Provide prompts like: “Tell us what your teddy did today”. Alternatively, randomly select from ideas for characters, problems, and settings, for example: “Tell us about an inquisitive mouse lost in a library”. Oral storytelling provides a bridge to written stories. Record on your phone or write down your child’s stories. Turn them into a book, animation, or slide show (with an app). Children will see the transformation of their spoken words into written words. These stories can be revisited to reinforce learning of words, story structure and grammar. Talk about their experiences. For example, prompt them to describe something they have done, seen, read or heard about. Research shows children’s oral language supports their literacy development, and vice-versa. Guide literacy in your children’s play, following their lead. For example, help them follow instructions for making something, or use texts in pretend play, such as menus in play about a pizza place. Children will engage with various texts and the purposes they have in their lives. Books, books, books. For babies and toddlers, start with durable board books of faces, animals and everyday things with few words that invite interactivity (e.g., “Where is baby?”). Progress to more complex picture books with rhyming language. Talk about personal links with the stories and ask questions (such as “I wonder what will happen next or where they went to”) as these will support comprehension. Look to the Children’s Book Council for awarded quality children’s literature. Talk about words children notice. Be sure the words make sense to children. Talk about what words look like, what patterns, letters and sounds they make. This builds children’s word recognition and attack skills, and understanding of what words in context mean. Involve your children in activities where you use literacy. For example, if you make shopping lists or send e-cards, your children could help create these with you. Explain what you are doing and invite children’s participation (e.g., “I’m looking at a map to see how to get to your friend’s house”). Children can meaningfully engage with and create texts and see the place these texts have in their lives. Use community and state libraries. 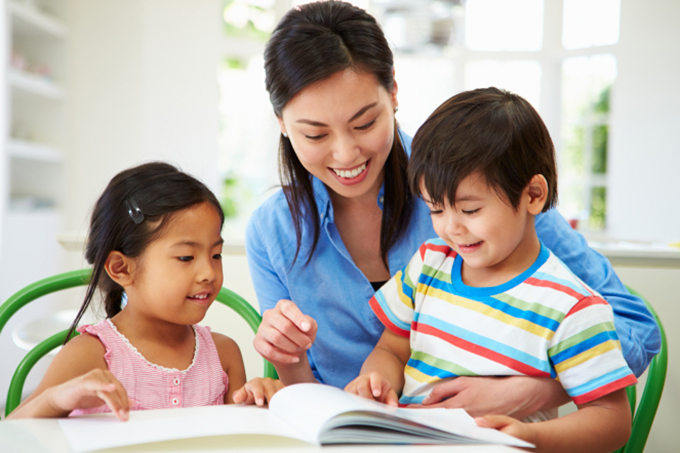 Most offer interactive family literacy programs. Early Years Counts and The Australian Literacy Educators Association has a range of resources for families. Above all, be sure the experience is enjoyable, playful, and encourages children’s active involvement. Literacy should be engaging for your children, not a chore.